In South Dakota, local taxpayers foot more than half of the public K-12 schools bill. State spending for South Dakota’s public K-12 schools covers less than a third of the cost of education while local taxpayers pay more than half the bill, according to a South Dakota Dashboard analysis of recently released federal data. South Dakota ranks almost dead last in state-level funding and lags every neighboring state for total per-pupil spending, the data shows. In total, South Dakota spent more than $1.1 billion on public K-12 schools in 2013, with $712 million (54 percent) coming from local taxes, $408 million (31 percent) from the state level and $195 million (15 percent) from the federal level. In addition, South Dakota ranks last among all neighboring states for total per-pupil spending, including local, state and federal sources. In 2013, total per-pupil spending was $10,087, placing the state 41st among the 50 states. Neighboring Wyoming ranked sixth and spent $18,498 with $9,626 coming from the state level. All data used in this release comes from the U.S. Census Bureau's 2013 Annual Survey of School System Finances. 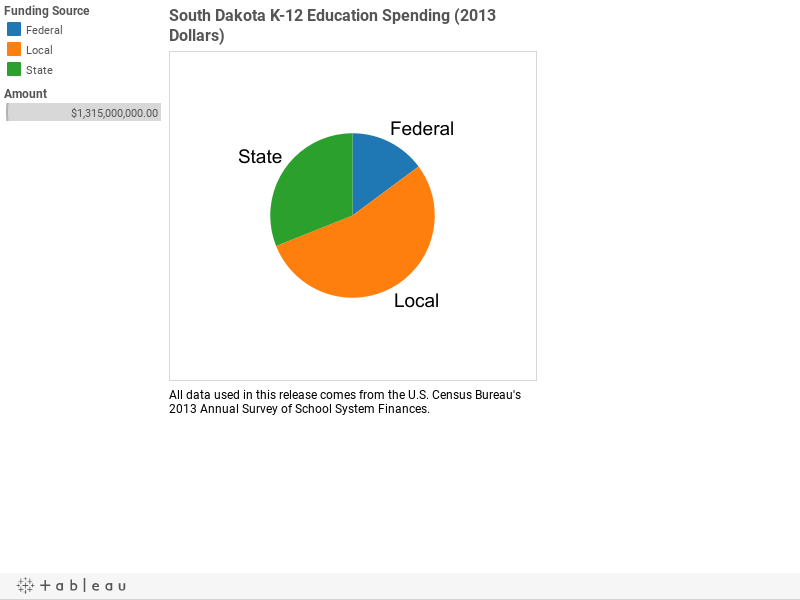 This look at K-12 funding in South Dakota is the first in a series of reports highlighting data specific to education statewide by the South Dakota Dashboard and the Black Hills Knowledge Network. The series will examine what the available data shows about education funding, practices and achievements both statewide and in individual school districts. To view other segments, see our Education Data Series Archive.